Vice President Yemi Osinbajo met with the Inspector-General of Police, Ibrahim Idris, behind closed doors at the Presidential Villa on Monday. 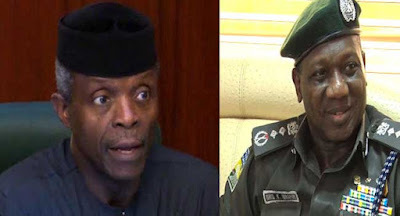 The purpose of the visit is not clear but there are speculations that the meeting is connected with the protests by some policemen in Maiduguri, the Borno State capital earlier in the day over the alleged non-payment of allowances. At the end of the meeting, the IGP declined to speak to journalists. The Vice President has also been silent about the meeting. Meanwhile, President Muhammadu Buhari is expected back in the country tonight from Mauritania where he attended the 31st Ordinary session of the African Union Assembly of Heads of State and Government. Some police personnel deployed in Borno State took to the streets of the capital, Maiduguri, on Monday morning barricading major roads about the headquarters of the Borno Police Command. The officials were demanding the payment of five months of allowances while also decrying the alleged failure of the authorities to meet their basic needs. The Borno State Police Commissioner Damian Chukwu confirmed the protest which lasted up to three hours. “We woke up this morning to experience a protest at State HQ gate by visiting PMF men in Borno State over unpaid special duty allowances for five months running,” he said in a message. The command later issued a statement saying the situation had been brought under control and urging residents of Maiduguri to go about their business without fear.